Four weeks ago or so, NASA’s JPL successfully landed the rover “Curiosity” (wikipedia) on Mars. The landing was probably one of the most watched (and celebrated) events on the Internet, witness the many gifs of cheering NASA people (Happy NASA guy and Happy NASA people) and the pop-rock-star treatment of the NASA engineers at Reddit (“We’re engineers and scientists on the Mars rover mission”). As any major news event that at one time broke the Internets, news and interest in the Curiosity rover is slowly dwindling down. However, great photos and mission details are posted on Curiosity’s main site at NASA (MSL website). My favourite one is the movie about the landing (taken from images from the one of the rover’s cameras), which thanks to the Internet, was then made into a HD 25 fps movie, which you can watch right on Youtube. If you like hi-res images of anything but Mars, go here. I’ve always been a proponent of unmanned flight as I’ve mentioned in earlier posts years ago. The risk of losing a rover is worth less than the risk of losing people in extremely dangerous environments. NASA’s MSL project is supposed to last a year. No doubt, the rover will keep trucking for a long time after that. This entry was posted in Scientifically and tagged Curiosity, Mars, NASA on September 3, 2012 by Arthur. I wash my hands a couple of times in a day, which would make me a qualified “marsonaut”. No wonder people romanticize a mission to Mars. This entry was posted in Scientifically and tagged human space exploration, Mars on February 13, 2011 by Arthur. L ast Friday, Benoit Mandelbrot died, which was widely published around on the Internet. Generally adored by nerds, Mandelbrot, while respected, was a fairly controversial figure in the mathematics world. Mandelbrot doesn’t spend months or years proving what he has observed,” for which he “has received quite a bit of criticism. … But if we talk about impact inside mathematics, and applications in the sciences, he is one of the most important figures of the last 50 years. I dare to say that Mandelbrots formulas took off with the introduction of the 8-bit colour homecomputers (earlier on xsamplex in 2004) and all these fractal generating programs. On our MSX2, I think it took at least a week to generate a simple Mandelbroth (320 x 250 with 256 colours). Even with earlier versions of Fractint on 286 AT machines, it would take days: today’s processing power does this in less than a second. Whenever I think of Benoit Mandelbrot, I think about how fast computers have progressed in those years. 10/24/2010: Jonathan Coulton’s ‘Mandelbrot song’. This entry was posted in Scientifically, We-reflect-news and tagged fractals, Mandelbrot on October 17, 2010 by Arthur. My favourite peeve is a rant about Heathrow, London’s premier airport with those long line-ups, confusing pedways and oh-so helpful security guards (earlier on xsamplex). And irritating survey people who question you why you didn’t buy that backpack even after you punted that the British pound is a bit overpriced. So what else is there to bemoan about? On the bright side, if the British Tories win the next elections, they promise to scrap the plan, which will keep Heathrow in the top 10 of most hated airports in the world. 01/28/09: It’s going to be a third runway. This entry was posted in Scientifically, We-reflect-news and tagged Heathrow on January 17, 2009 by Arthur. I hear that if you give mathematicians a couple of beers, you can convince them that the Earth is only 5,000 years old. I’m not joking: please try it on your local math teacher! When i heard that there were black holes in other galaxies, i was fine with that, since they are so far away. But now i hear there is one in OUR galaxy? That’s kinda scary, since its so close to us! Oh: this Hubble telescope that they launched in the 80s, yes? It still seems to be hitting the news: this time, astronomers managed to find CO2 in the atmosphere of a planet circling around a star, what, 65 million light-years away. And hanging around the Discovery site: Did you know that 2008 will get one extra second? I remember this happened years ago too, which is exactly the reason why I tend to be at work 2 seconds later than normal. Who else can I blame for this? Update 1: Weird The Onion picture about science. Update 2: Related: Astronomers dissect a black hole with. What? This entry was posted in Scientifically and tagged astronomy, big bang, science on December 12, 2008 by Arthur. 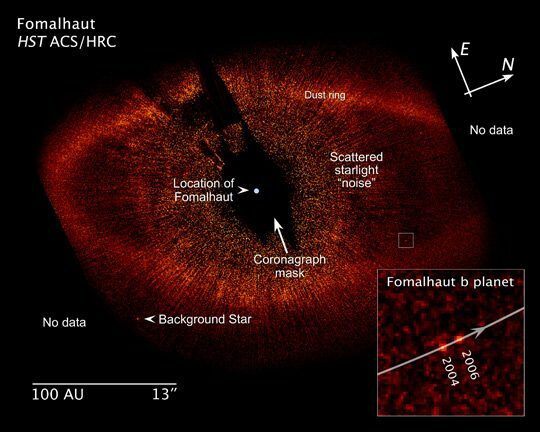 US astronomers have made the first photo of an exoplanet that makes it rounds around the star Formalhaut. It took a couple of years (and a lot of patience) to actually confirm the planet though. Additionally, another team of astronomers made a picture of 2 planets orbiting a star called HR8799 (Washington Post report). Generally, it seems. it was a good week for astronomy. 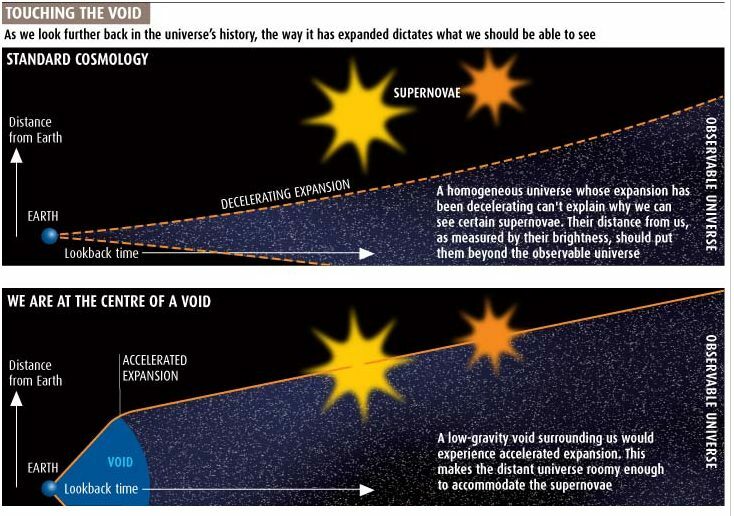 New Scientist had an article about a theory that the Earth might be in the center of a void: at the heart of the discussion is the 1998 discovery that some galaxies seem to have been racing away from us instead of slowing down. This discovery is currently explained by introducing ‘dark energy’, the energy that tends to accelerate the rate of expansion of the universe. The new theory proposes that our universe (the Milky Way) is surrounded by a ‘bubble’ that causes photons to lose energy but gaining energy while leaving this bubble. I also read that India has succesfully landed a probe on the moon. For the next couple of weeks, the probe (‘Chandrayaan 1′), will measure the composition of the moon’s thin atmosphere. This entry was posted in Scientifically, We-reflect-news and tagged astronomy, science, space exploration on November 15, 2008 by Arthur. You can get out of your bunkers now: I hear that the first test run at the LHC was a smashing success. The actual smashing happens later this year, so you may want to keep an eye on any black holes originating from Europe. If you’re into big explosions and that (I’m looking at you Dr. Horrible), maybe you should consider a career in Quantum Physics. This leaves me wondering about the current (and future) state of science in the US: the LHC was built and mostly funded by European countries. The lab has attracted over 1000 US scientists, who according to previous linked Globe and Mail article, ‘feel strongly that the United States is no longer a place to practise massive-scale experiments’. You may wonder if this has to do with the last 8 years of the Bush administration, where science didn’t seem to be of importance. That is, unless you count the president’s vision for ‘the moon and Mars’ as a scientific milestone. Update 2: BBC documentary ‘The Big Bang’. This entry was posted in Scientifically and tagged quantum physics, science on September 13, 2008 by Arthur. Via Aetiology, I found out that the Marburg virus was discovered in a Dutch woman: According to Dutch reports, Friday (or Thursday night) she didn’t survive (Dutch language alert, see also WHO report about the individual case). That same article at nu.nl reports that around 100 people that were in close contact with her have been put under medical observation, which I presume means that they probably regularly have to contact their family doctor about their physical condition. The Marburg virus hit Europe before in 1967 when 30 or some people became infected with the virus: the primary infections were lab workers who did experiments on monkeys, which were imported from Africa. Technically, the virus is part of the filovirusses group, which also includes the Ebola virus. “The structure of the glycoprotein shows us the very few sites on its surface that are not cloaked by carbohydrate,” Ollmann Saphire explains. “These [sites] are the chink in the armor, or the Achilles’ heel, that we can target antibodies against. The article reads like a report from a war-zone, but then, this kind of research is like a nuclear arms race. This entry was posted in Scientifically and tagged virus on July 13, 2008 by Arthur. This week, the New England Journal of Medicine reported about a small success in the fight against (skin) cancer: An Oregon man diagnosed with skin cancer, was injected with a couple of billion of cloned T-cells of his own and saw his cancer go into complete remission. Via Slashdot (thread), it appears the old adagio holds true: Bad boys get all the girls. I also hear that thrill-seeking male humans have a shorter lifespan, or, eventually shut themselves out of the mating process because of a lack of other useful skills needed in societies driven by the sciences. This is old news: your mom (and dad) warned you to stay clear from people like these. Also: what about bad girls? The best part is last: CNN has a whole bunch of sections dedicated to ‘busy moms and parenting’. The one article that attracted my eye was the one about mothers with twins, which reads as a proof that humans have lost the ability to provide and care for twins. Hey: In general, twins can perfectly take care of themselves, particularly when they’ve figured out how to communicate with each other. This entry was posted in Scientifically and tagged cancer, science, twins on June 22, 2008 by Arthur. Missing: 2 Milky Way arms. 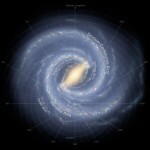 I found this map of the Milky Way (warning HUGE [5000×5000]) via Reddit (thread). 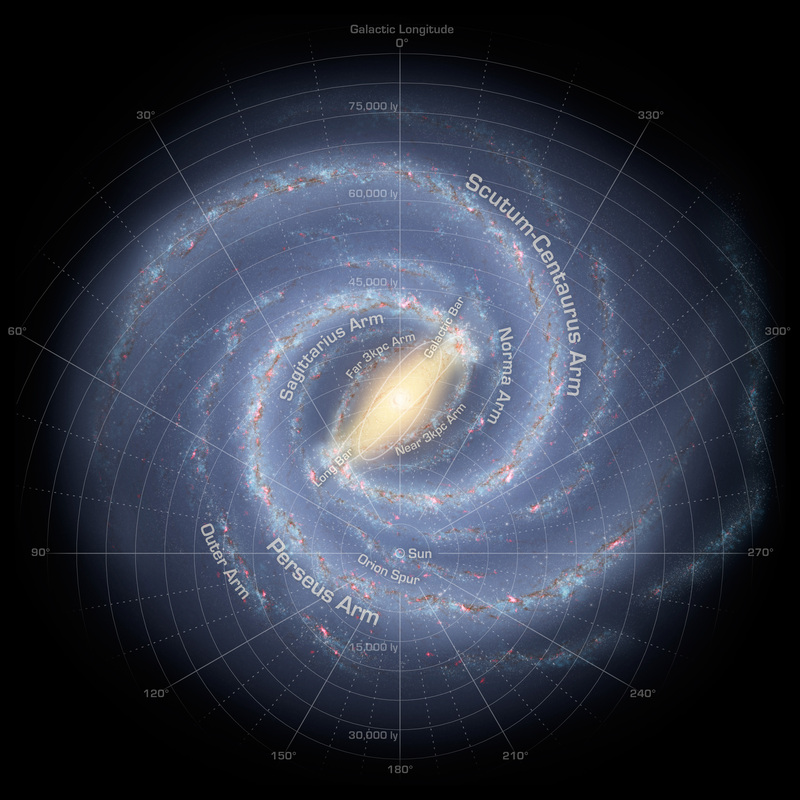 The picture comes from NASA’s Spitzer Space Telescope, and (ofcourse), comes with a brief press release about the actual point of the map: Two of Milky Way’s arms have gone missing! And you thought the announcement that mrs. Clinton was going to suspend her campaign was important news. Uh, no. Maybe. If you’re curious where we are at, click the image above. If you like spoilers, or, worst, in case you get kidnapped by a bunch of Space Invaders who look slightly similar to Mork from Ork: Our small sun is located near an arm called the Orion Arm, or Orion Spur, which is located between the Sagittarius and Perseus arms. Update 1: These kinds of maps remind me a bit of the earliest ones of our planet. Update 2: Oh dear, you may want to have this webpage ready (constellations, constellations!) on your iPod Touch in case you really get abducted by Mork. This entry was posted in Scientifically and tagged astronomy on June 4, 2008 by Arthur.